Will there be a special PES 2015 "Day One Edition"? A report on Spanish site PESFan/es suggests that there will be a special PES 2015 "Day One Edition". 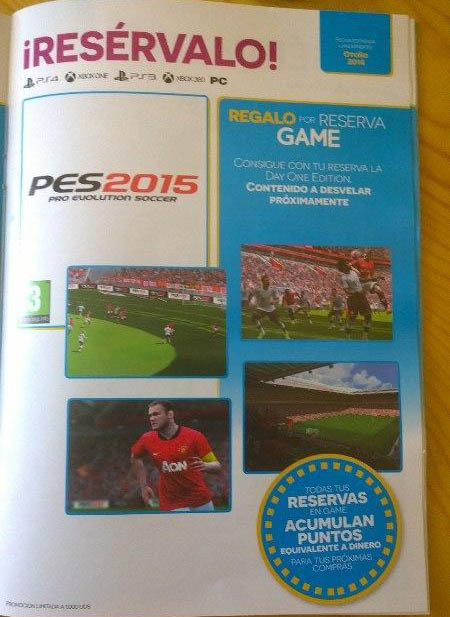 Twitter user @Joseamc91 spotted the info in a Spanish catalogue of videogame retailer GAME, on the page about PES 2015 it reads "Pre-order the Day One Edition - Content to be revealed". As the info comes from an official catalogue by a major retailer, the info is very likely to be true and there will indeed be a special PES 2015 Day One Edition. There will very probably be a special PES 2015 "Day One Edition". This is an image of the page from the GAME magazine. There already was exclusive pre-order content (which was later made available for everyone) in form of special 3rd and classic kits for some teams including Juventus and Manchester United. It is likely that the PES 2015 Day One Edition will feature similar stuff. There could possibly also be something related to the new MyClub mode, Pro Evolution Soccer's attempt to counter FIFA's Ultimate Team. Anything from ingame currency to some improvement starting players comes to mind. With Gamescom only some days away (starts August 13) we will surely hear about the PES 2015 Day One Edition from Konami there. Konami already confirmed they will be making many announcements at their Gamescom 2014 press conference with licenses, release date or demo possible topics. The official PC PES 2015 system requirements should also be unveiled at Gamescom.